Amazon Price: $17.74 (as of April 18, 2019 8:24 pm – Details). Product prices and availability are accurate as of the date/time indicated and are subject to change. Any price and availability information displayed on the Amazon site at the time of purchase will apply to the purchase of this product. 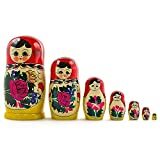 7" Set of 7 Semenov Traditional Hand Painted Wooden Matryoshka Russian Nesting Dolls The inimitable painting found on all of our nesting dolls is used here to artistically recall the flowers loveliness. This matryoshka can be a thoughtful gift, appropriate seasonal or year-round decoration, a special addition to an existing collection – or all of the above! Features: 7pieces 7" (H) Largest Doll Linden Wood, Gouache, Lacquer Hand Painted Made in Russia The manufacturing of Russian nesting dolls is a very specific process. These dolls, made famous in the late 19th century, are still one of the most classic of all Russian art pieces, though they were meant to be toys. The production of them today is the same as it was years ago. Each of the dolls comes from the same block of wood. The artisan cuts the block of wood into two pieces. Then, the top and the bottom pieces of the wood are cut off. The process continues until there is just a small amount of wood left. The manufacturing of Russian nesting dolls then continues with the carving of each into an oval shape. After carving them out, the pieces come to life when painted flawlessly. WARNING * Choking hazard * Not recommended for kids under 3 years due to small parts inside.